As a teacher, I am grateful for moments like these — both the resolution and the dejection that precede it. The course in question introduces students to concepts of theatre design and construction. In an age when digital media provides instant gratification, the experience teaches perseverance by giving students applied challenges with real-life consequences, which often require multiple disappointments before achieving success. 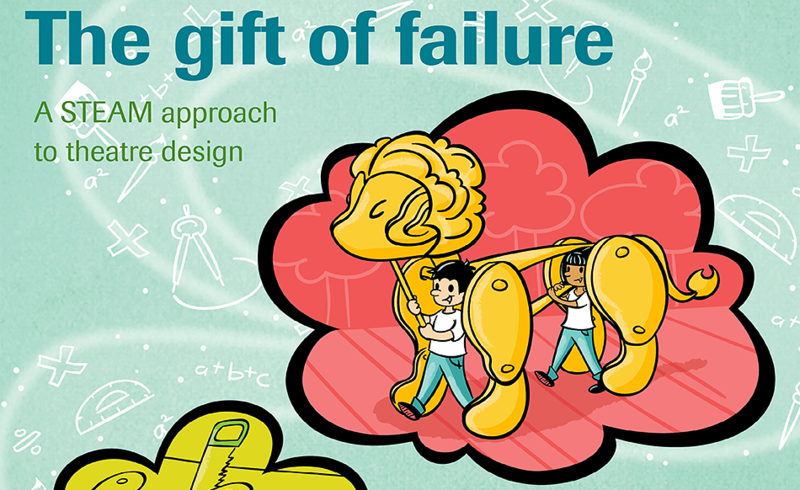 The collaborative and hands-on content of this course requires students to take risks, fail, and push through those failures to achieve a cooperative, creative goal. Statistics indicate that major industries suffer from shortages of technically trained workers in science, technology, engineering, and math fields, because growth in such professions, particularly engineering and computer technology, stimulates greater demand for skilled professionals. The U.S. Bureau of Labor Statistics projects overall STEM employment to grow about 13 percent between 2012 and 2022, faster than the 11 percent growth projected for all jobs in the next decade. Educators counter that 21st-century skills — including collaboration, leadership, and problem solving — are also indispensable for strengthening the U.S. workforce and increasing our global competitiveness. 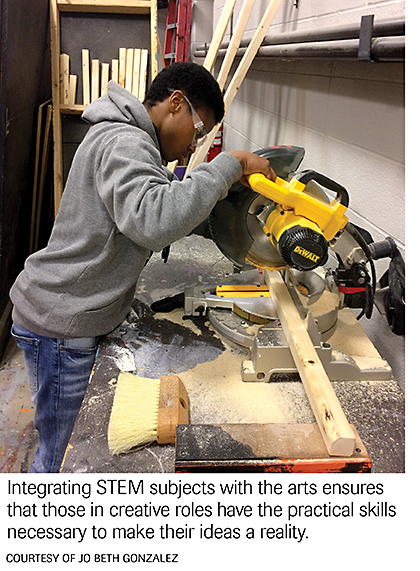 These skills put the “A” in STEAM, the recently revised acronym describing the pedagogical integration of the arts into STEM fields and vice versa. Such integration aims to prevent a future in which highly trained engineers lack the imagination for finding creative solutions and artful designers lack the practical skills needed to make their ideas a reality. Many university educators recognize the correlation between the arts and more technical disciplines. For example, engineering students at Purdue University are encouraged to take interdisciplinary theatre classes. Such courses include sound design, scenery engineering, and lighting design. Theatre technology education requires students to connect analysis and memorization with expression and experimentation, encouraging — rather than stifling — the creativity inherent in science, and fostering the rigor and critical examination essential to the arts. Meanwhile, the theatre design course at Bowling Green High School originated because my skills as a theatre teacher in design and construction were limited and because teaching students can be the fastest way to learn. At first, our school had no auditorium, and the spaces in which we rehearsed and performed were dangerously outdated. I relied on the most experienced students — those who had taken vocational technology classes or had practiced the skills with a parent — to lead and teach peers about design and construction. Our sets were always minimal. When our state-of-the-art performing arts center was built eight years ago, we advocated for a theatre manager who also serves as tech director for our fall plays and musical. With this role now in place, we are now capable of staging technically complex productions. In our course, we task students with designing the set pieces of our fall play. One primary quality of the course is that it is highly collaborative and diverse. The students range from ages 14 to 19, and there’s no prerequisite, so skill sets and interests vary widely. Students are en-couraged to drive their learning in the class, which involves research, presentation of ideas, giving and receiving peer criticism, and maintain-ing progress reports. This team-driven atmosphere intensifies commitment to shared goals and fosters emotional support. Students don’t want to fail their classmates. “If you miss school one day, or you’re slacking and not carrying your weight, then you’re not only hurting yourself and your grade, but you’re also hurting the members of your team,” says sophomore Kyle Jackson. Three constraints guide students throughout the design and construction phases of each course: time, skill, and budget. STEAM pedagogy is pervasive throughout the semester. Each group begins with two weeks of research, followed by two days of thumbnail sketching and presentation, a week of prototype building and sharing, a month of construction, and a week and a half to implement their group project be-fore tech week. Students present their ideas in class. Our theatre manager, Ryan Albrecht, then weaves the most workable of the students’ ideas into the overall vision that we have established as the show’s parameters. He presents a final series of designs to the students, which are heavily influenced by their creative ideas. The recent Aslan project was based on a production of the same show performed at Ontario’s Stratford Festival the previous summer. That production featured a skeletally built lion in the fashion of War Horse puppets. 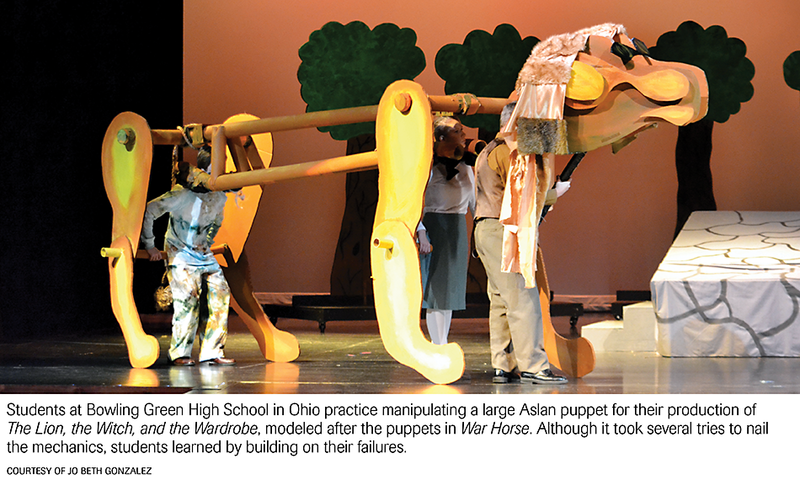 Inspired by this, I tasked students with creating an over-sized puppet that would be operated by three actors: one to manipulate the head while speaking lines, one to work the front legs, and one to control the back legs. Thirty-eight students enrolled in two separate classes whose mission it was to design the sets for The Lion, the Witch, and the Wardrobe. Besides the Aslan puppet, projects included the White Witch’s sleigh (large enough for three actors), an 8-by-16-foot stone table that needed to crack into two pieces and remain stable while Aslan stood atop it, a two-piece treescape, skeletal components of the Beaver home, and an oversized wardrobe. The teams began by reading the script to determine set and special effects requirements. They also read several chapters from the novel to gain details for set pieces and special effects from the original source. Next, they researched relevant theatre design. For example, the Aslan team examined video productions featuring Aslan (both as a large puppet and a single actor) and excerpts from War Horse, as well as other larger-than-life puppets from around the world. Students searched for pictures of real-life examples of their set pieces and production photos from other shows and presented them to their peers. They watched video clips to examine solutions to solving special-effects challenges (such as the stone table breaking) that other theatre companies discovered. Designing then followed. Students measured for precision when determining the degree of the slant for the stone table. When drawing Aslan’s parts, proportions needed to be realistic. Transitioning from Aslan prototype to the real puppet required students to draft a scale so the puppet pieces would not be too large or too small. Aslan’s construction also required ingenuity, because his legs needed to bend realistically. Students discovered the need for a restricting piece to keep the legs from bending too far forward or back. Making clean-curved cuts with the jigsaw was an important aspect to engineering the puppet as well, requiring a steady hand and careful eye to make edges smooth and curves geometrical. Once they cut out and assembled the design prototype, the Aslan team was stymied by how the various pieces would stay connected. Stu-dents received onsite advice from Bradford Clark, a puppeteer and theatre professor at Bowling Green State University, as they continued to experiment, finally deciding to use a combination of three-quarter-inch cardboard mats, long four-inch cardboard tubing, zip ties, and duct tape. This is when they realized that ideas will continue to percolate unconsciously even when one is consciously hindered. <p">Confident of their design, they drew the puppet pieces to scale, cut them out, attached, and securely fastened them. Originally, they built the mane using curled lengths of brown paper, but that design proved problematic. They were charged with constructing a mane that would be removed onstage and reattached backstage during a scene change. This step complicated their task, as it proved time-consuming to correctly Velcro the mane onto the head in low light. Students replaced the curled paper concept with a design made of fabric and faux fur. The final step involved bringing the puppet to life. As the puppeteers explored ways to give the puppet breath and convey five expressions — anger, weariness, admonition, defense, and pride — the design team tested the puppet’s workability and stability (a test that proved additional reinforcement was necessary after one of Aslan’s legs fell off during a final dress for middle school students). Trial and error was an experience that every student encountered. For example, two boys were challenged when creating an Aslan-like face out of half-inch plywood. Using the photo as a model, they cut out a design that they thought would work. After several attempts, they be-came frustrated that their lion resembled a platypus-like bear, and they realized that a more simplistic design would better serve their objective. “Because of our failure, we learned that a design with less rather than more detail worked best,” says junior Jackson Sabin. This approach to education benefits teachers as much as it does students. Albrecht is responsible for introducing students to the safe use of equipment and translating their creative design ideas into realistic and achievable pieces. The final realized design for a production can evolve far beyond what a single technical director might envision, as they may not have otherwise considered many of the ideas that students suggested. This course also provides a bridge to the greater community and across disciplines. It’s vital to applied arts and sciences to tap specialists for advice and even invite them to meet with students when components of the design are less familiar to us or become baffling. For example, we sought expertise from a parent with skill in mechanical engineering to configure the contraption that cracked the stone table dramatically, yet safely, and we consulted Clark for suggestions on constructing and incorporating our Aslan puppet into the production. Such collaboration helps students design and build to their fullest potential and demonstrates the value of developing partnerships within our community, which is a component of STEAM education.